TakeProfit- The fixed take profit value in points. If 0 then no take profit will be set. RSIperiod- Period setting for the RSI indicator. AppliedPrice- Applied price setting for the RSI indicator. Set 0 for close price, 1 for open price, 2 for maximum price, 3 for minimum price, 4 for median price, 5 for typical price and 6 for weighted close price. 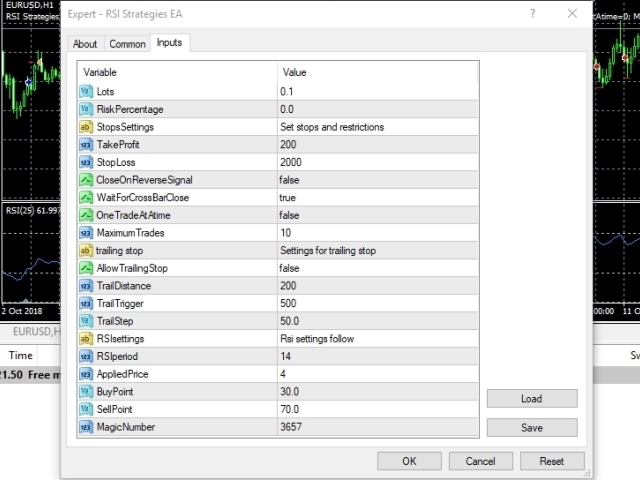 In the EA, a buy signal or uptrend is when the RSI crosses the BuyPoint setting upwards and a sell signal or downtrend is when the RSI crosses the SellPoint setting downwards.